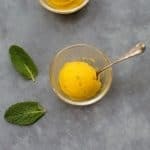 This Thermomix Mango Sorbet with Mint and Lime tastes just like a Mojito but without the rum! It’s refreshingly creamy, tangy, tropical and naturally sweetened with honey. One of the best things about the Thermomix is it’s ability to make sorbet in less than 5 minutes without the help of an ice cream maker. Unfortunately store bought sorbets are packed full of sugar and other additives so making your own is definitely worth the effort. Both Coles and Woolies sell frozen mango pieces in the freezer section for about $4 each so you could make this dessert all year round. I’ve never been good at cutting fresh mangoes properly so the frozen pieces make life so much easier with less mess. 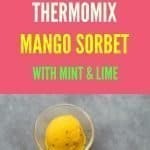 Thermomix Mango Sorbet – a refreshing sorbet that tastes like a Mojito but without the rum! 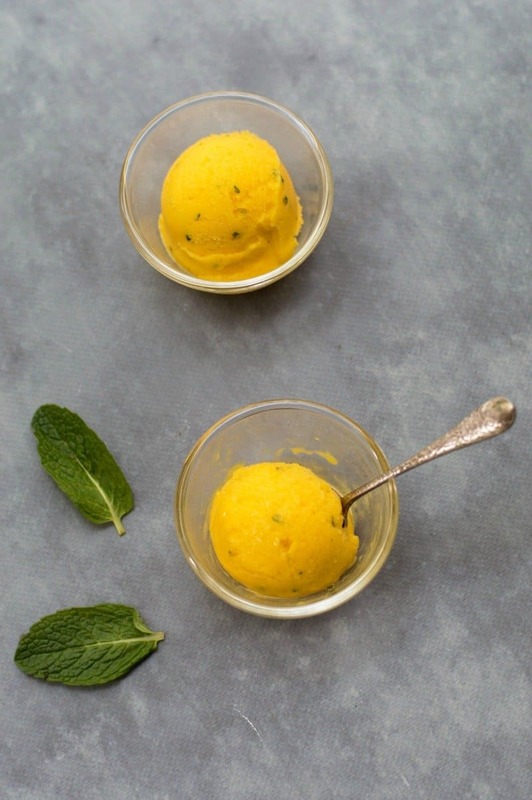 Made with mangoes, mint, lime and a little honey, it’s ready in minutes. Add the mango and mint to the TM Bowl and blitz for 20 sec/speed 9. Scrape down the bowl. Insert the butterfly attachment and add all the other ingredients and mix for 1-2 minutes/speed 3 until nice and creamy. Sometimes the butterfly gets stuck and the error beep occurs – if this happens just keep scraping the bowl down. It will eventually work as the mangoes begin to softens and thaw out. Both Coles and Woolies sell frozen mango pieces in the freezer section. A 500g pack is about $4-5. This was great! My mangoes were super ripe when i froze them so i didnt add honey. I also added a dollop of coconut yoghurt for extra creaminess. Thank you for your lovely feedback, so glad you enjoyed it. I must try it with coconut yogurt next time.